This article is ported over from my Friday 5 Answers blog, in which participants answer weekly questions posted to the Friday 5 blog. Since this week’s topic dealt with cameras, photography, technology and Apple devices, it is also being posted here. “Hello, and welcome to this week’s Friday 5! Please copy these questions to your webspace. Answer the questions there; then leave a comment below so we’ll all know where to check out your responses. Please don’t forget to link us from your website! 1. What was your first camera like? The first camera I had was part of a Sears’ Superspy Attache Case that I got for Christmas in 1967. The camera was built into the attache case. It had a plastic fixed focus lens, used one of the case’s folding latches as a viewfinder and took 127 roll film. I think I shot about 2 rolls with the thing. The pictures were about as good as what you can get from a plastic Holga camera today. Moving into the 1970s I had a Kodak X-35 Instamatic camera that took 126 cartridge film. My first 35mm camera was a black Yashica MG1 rangefinder. It died about 25 years ago. My first SLR camera was a used Minolta SRT-101 which I got for $70 in 1978. I have that camera today and it still works. My first digital camera was a Sony Cybershot P50 point and shoot that cost me $400 in 2001. I bought it from Comp USA. My Minolta SRT101 shown with an old school 70-210mm zoom lens. 2. What kinds of accessories have you purchased for a camera? Oh boy… yes, this could be ten pages long. Do you want a book or an abridged list? I think I will go with a short list. Stuff I bought for film cameras: Tripod, lenses (wide, normal, zoom, telephoto), motor drive, auto winder, trip cable, PC cord, external camera flashes of all types, camera bags, batteries, recharger, lens tissue, cleaning brushes, film, film, film, and still more film, and more camera bodies. When I had access to a darkroom I bought film developers, print developers, and photographic paper. I also bought negative holders and sleeves to keep those things organized. Oh yeah, binders, photo albums and picture frames. By 1992 I had to upgrade my computer from a Mac Plus to a Mac IIsi so that I could look at my scanned photos in color on the computer… and of course I had to buy a scanner to scan in all of those old and current prints (at the time) I was getting. I used to have tons of floppy discs just to back-up those scanned images and to also share them… In the bad old days of 56 baud or less modems, it was a pain to share images online… so you’d use floppies, and later SyQuest discs and Zip discs to send your pictures to friends, relatives, clients and service bureaus. I haven’t even gone into digital yet. And you know what I’ll stop here except to say that if you get seriously into photography as either a hobbyist / enthusiast or professional, it is more than likely you will get the following disease: Gear Acquisition Syndrome (GAS). Make sure you have space in your home for all of the stuff! 3. When did you last shoot photos on film, and how many rolls of unshot film do you have in your house? Um… let me think… about 2 weeks ago. I finished off a roll that was in my Canon AE-1 Program camera. This turned out to be my last Kodak black and white CN400 film. This type of film can be processed with C41 chemistry, the same stuff that is used for common color print film. When you don’t have access to a darkroom, C41 color development is cheaper than going the Kodak Tri-X route because the one place I take my film for processing does that by hand and costs more. They still use a machine to do C41. As for rolls of unshot film… I think I have one roll of 620 film in a box somewhere, another roll of Seattle FilmWorks 35mm film in its cannister. I also have the following cameras loaded with rolls in progress: Kodak Brownie Hawkeye Flash (620 color); Minolta Autocord TLR (120 TriX); Swimways plastic camera (35mm color); Minolta XD11 (35mm TriX) and Minolta X700 (35mm Fujicolor). Through most of my SLR film days, I’ve been solid in the more affordable Minolta camp than with the leaders Canon or Nikon. By the way you can still get films at many camera places online or if you live in a city, at stores specializing in film. My place to go online is the Film Photography Project store (they have a goofy but informative podcast). Locally (in Honolulu) I go to Rainbow Photo & Video or to Treehouse. 4. Digital photography has all kinds of advantages over film photography, but what’s better about shooting on film and having to get it developed and printed? That is a hard one to answer… certainly there is something about film that is “magical”, and I guess more so when I used to have access to a darkroom and spent many hours developing film and making prints. It was like magic to see the image you shot being projected down in the print enlarger, editing it, then pulling out the paper and making the exposure for a few seconds. The process of putting the blank piece of photographic paper into the tray developer (usually D76) and watching the image slowly but surely become visible to your eyes. Then of course quickly moving it to the stop bath and then fixer before some idiot walked into the darkroom and turned on the regular light! Developing the actual film in the darkroom was more anxiety vs. intrigue since nearly everything had to be done in total darkness vs. being able to use a red safelight during the printing phase. The “thrill of the hunt” or better said, the process of developing and converting the image you shot into a beautiful print was / is most appealing of going to film. It is not the same when you send your film out for processing and printing, though the anticipation of wondering what will come back and actually turn out is always intriguing…. and often costly! Today of course you have the option to simply scan your film, look at the results and then decide if you want to print anything. 5. How do you manage your digital photos? 1. Take photo(s) with camera. 3. Save directly to designated, external hard drive in appropriate folder. 4. 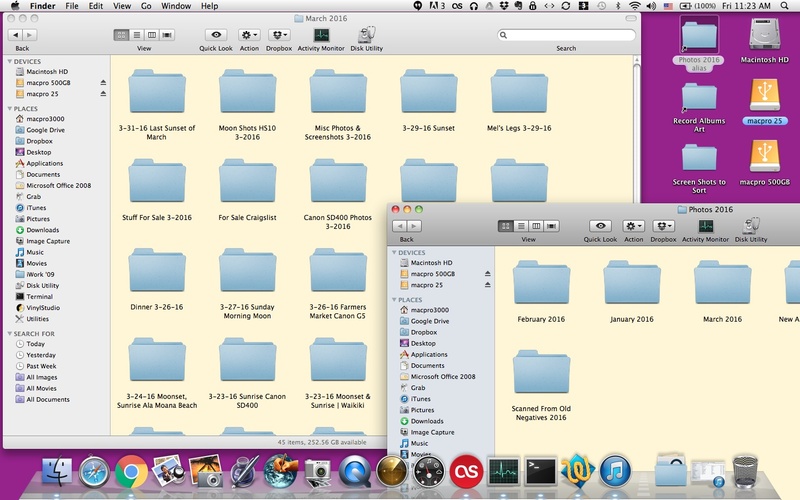 The folders are arranged by year – month – day/date/subject of the photo or series. 5. Back up to another hard drive or media. 6. Back up also to Google Photos (since mid 2015). 7. I used to back up to DVD or CD but don’t anymore. 8. I make sure at least one backup hard drive is stored away from my home (at sister’s place and/or bank safe deposit box). I also use Flickr and Facebook to back up selected, low level megapixel photos for public display. My way of saving and backing up photos is to simply use the Mac’s finder interface. This means when I insert the memory card into the reader, I just drag copies of the image files from the memory card to the designated folder on the hard drive. I do not use any photo management app (such as Apple’s iPhoto or Photos now) as my primary source of storage. I don’t like the large files these apps create. Plus I refuse to use the newer Apple Photos because the darn thing is aimed more at saving your photos to the costly Apple iCloud service which I don’t use. I prefer Google Photos since it is free. I also have Google Drive to save a copies of some high quality (over 16 megapixels each) images to. 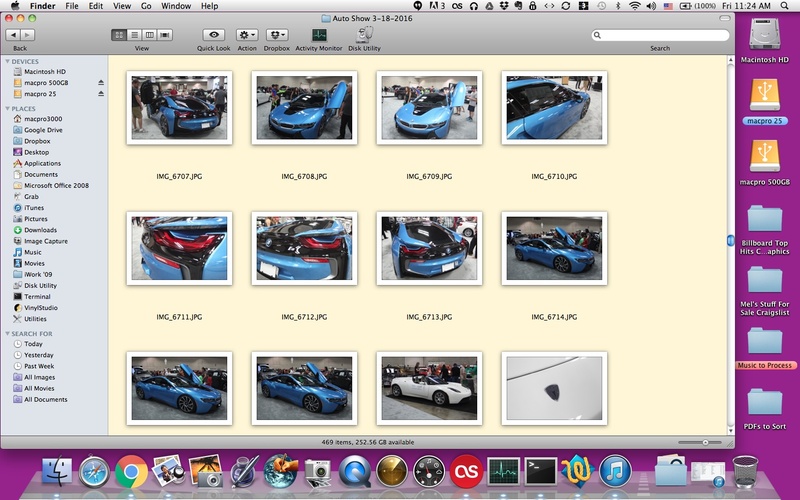 For photo editing I continue to use iPhoto (with Mac OSX 10.6.8, yes I love “Snow Leopard“). I also use Adobe Photoshop Elements, Pixelmator and Fotor for special effects and collages. Mobile Digital: I also have an older iPod Touch that I back up through Apple’s Image Capture software. The app allows me to store those iPod Touch images to designated folders like I do with my regular cameras and computer. I also have an Android cell device that allows me to go straight to the Apple finder with a USB connection and drag photo images to designated folders on the hard drive. The Android device is running the Gingerbread version of the OS. I don’t know how it works on the newer systems such as Lollipop and Marshmellow. Scanned Film and Prints: For these the process is the same as digital after the images go into the computer. I prefer to store photos of one image each into designated folders vs. having an app like iPhoto keeping them all in a huge, single file bundle or worst, defaulting like Apple Photos to the expensive iCloud service that I don’t use. Key is to have back-ups stored offsite cheaply and easily. An external hard drive stored off-campus is one answer and so is the free to use Google Photos online. This entry was posted in Apple, Applications, Commentary, Google, Photography, Technology and tagged analog, Android, Apple, Back-up, developing, Digital, Film, Friday 5, Google, iOS, Meme, OSX, Photography, Questions, scanning. Bookmark the permalink.